The EK9300 Bus Coupler connects PROFINET IO networks to the EtherCAT Terminals (ELxxxx) as well as the EtherCAT Box modules (EPxxxx) and converts the telegrams from PROFINET IO to the E-bus signal representation. 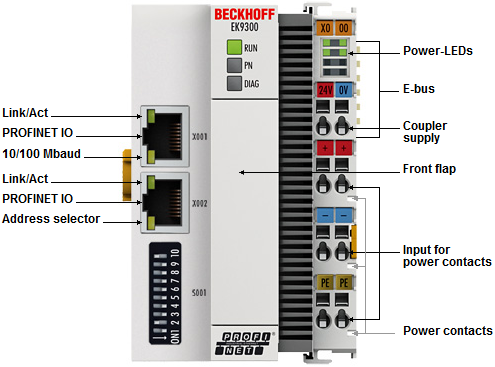 One station consists of an EK9300 and any number of EtherCAT Terminals. The coupler is connected to PROFINET IO via RJ 45. In EtherCAT, the PROFINET IO coupler has at its disposal a lower-level, powerful and ultra-fast I/O system with a large selection of terminals. The coupler supports the PROFINET IO profile and fits seamlessly into PROFINET IO networks.